After purchase of my Carrera I took it on a visit to my cousins. Our car mechanic friend, James, was also there. Both he and my cousins have an interest in bicycles. Everyone was impressed with the Shimano Nexus gearbox, but we couldn't work out how the roller brakes worked. The only way to find out was to take one of the brakes apart. We found that they worked in a similar way to a conventional drum brake, except that the friction was provided by metal on metal contact into a vee shaped drum, the shoes having a corresponding vee. The force is provided by a lever arrangement via a set of six rollers, hence the name roller brakes. 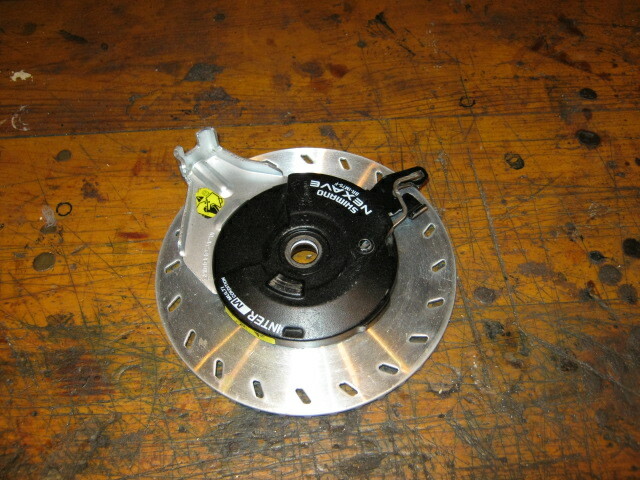 The brakes are not particularly powerful, but they do provide consistent braking force which is not subject to variation due to the damp conditions in North Lancashire. Any brake which operates on the wheel rim with exposed blocks is lethal on my ride home because there is a hill which you go down which, if you have rim grip type brakes, and it is damp, you start to brake as soon as you get on the hill, and you simply apply maximum force for the whole hill, and you're still going too fast by the time you get to the bottom. If you need more power than that provided by roller brakes you'll have to get discs, but rollers are more than adequate for most uses. That aside, after having taken the brakes apart, it was difficult to work out how to put them back together. They do go back together, and they do so easily, but as with many items of modern production methods, the order of reassembly is critical, and not obvious from the function or arrangement of the components. This is a guide only - got a set of hard and fast instructions. If you find it easier to modify the procedure laid out here then do so. Disassembly - follow your instincts for disassembly. Don't force anything, but you do have to bend back some retaining tabs from the cover. Do not worry about getting these tabs to bend back (actually you don't have to, see Jon's message at the bottom of this page). Get them out of the way, and leave them out of the way. 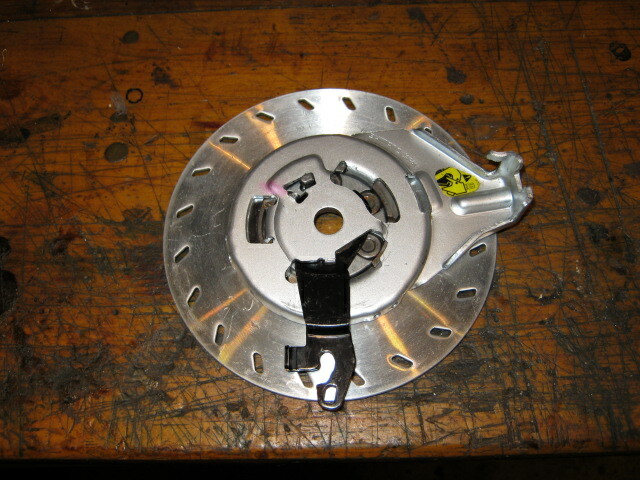 The brake is retained onto the axel by a nut, and this is the primary means of holding it all together when reassembled. 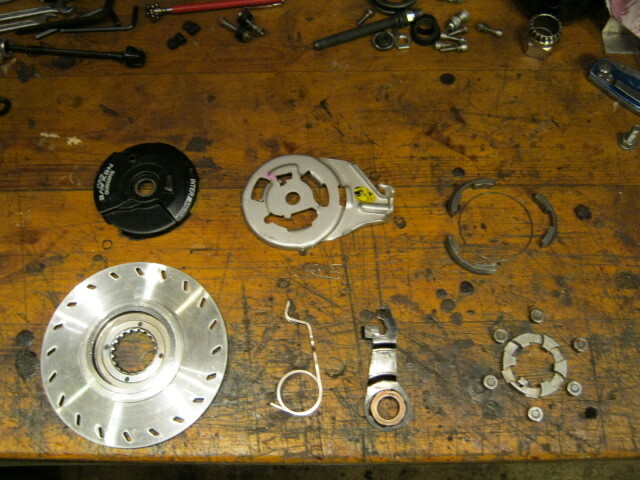 These are the main components. I shall use the following terms adapted from drum brakes to name them. From top left - cover, backplate, shoes with the shoe-spring in their centre. From bottom left - drum, lever spring, lever, roller cage surrounded by six rollers. The only component not features here is a roller cage retaining spring, which is the only component likely to fly off and hit you in the face, and get lost, when dissassembling the brake - so watch that. Preparation - clean off any grit and abrasives which might have gotten into the brake, and scrub up each component. This is the rear (wheelward side) of the drum. It has a seal on it which is located onto the drum by four lugs. Pop this off and put it somewhere safe. 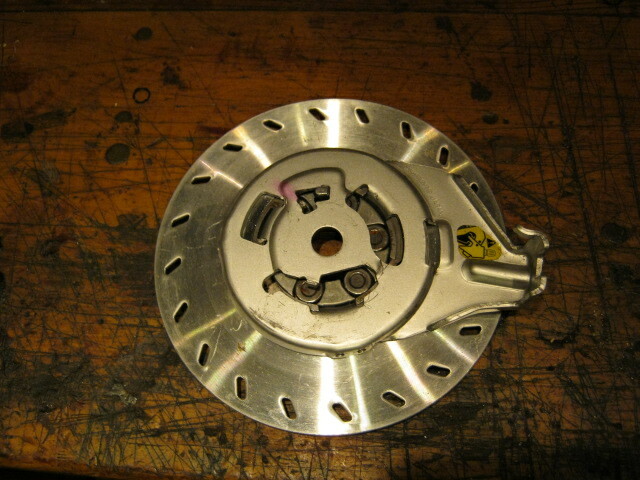 Put it back after the rest of the brake is reassembled. Shoes - The shoes are sided. 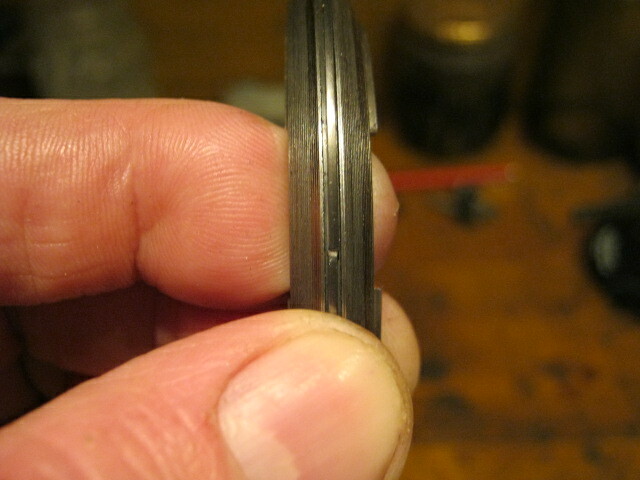 The figure shows the groove into which the shoe-spring fits. You will also notice that on the right of the shoe there are some lugs. These lugs should, when the shoes are put into the drum, be uppermost. The best way to proceed is to place the gap of the shoe-spring into the centre of one of the shoes, place that shoe, and the shoe-spring, into the drum, then place the two other shoes into the drum making sure the shoe-spring goes into the groove on each shoe. Shoes & drum - this is what you should end up with. All three shoes with the shoe-spring located exactly in their groves, and with their lugs protruding slightly from the drum. This is tricky to do well, so unless you are some sort of genious you will have to fiddle about for ages to get to this stage. Typically what happens is that the shoe-spring pulls the shoes from engagement with the vee of the drum, then slides from the retaining groove preventing re-engagement of the shoe with the drum. It just takes time and fiddling to get to this stage. Roller cage - next thing in is the roller cage. If the shoes and shoe-spring are in the drum properly this should just slide in. If it doesn't it probably means that the shoes are not soundly seated in the vee of the drum, or that they're the wrong way up. Do not force this component. It is a light metal die casting and won't be very strong. If all is well it will just drop into place with very little persuasion. Once it is in place align it so that the rollers will line up with the pads on the rear of the shoes against which they bear, then drop the rollers in. It should look eaxctly like the figure. 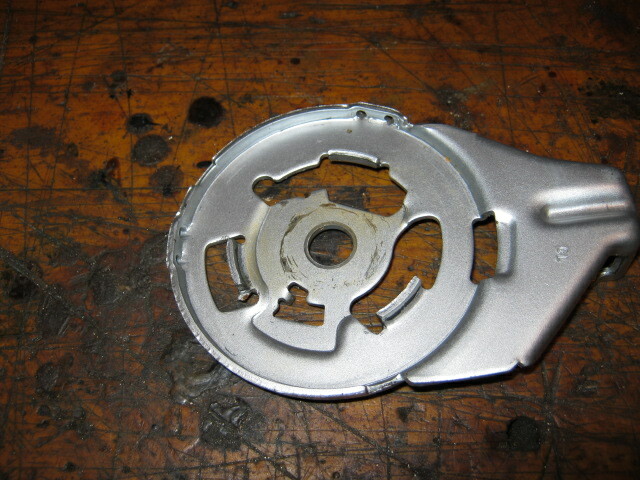 Backing plate - This is the reverse of the backing plate. 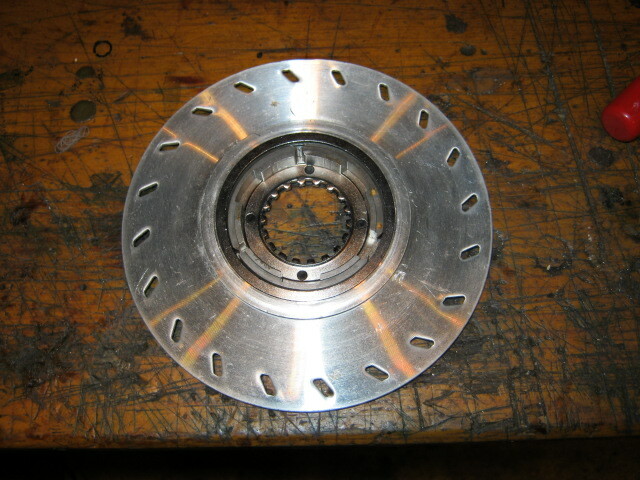 The protruding lugs engauge with the recesses in the shoes between the pads against which the rollers press. The lug which protrudes vertically from the roller cage (see previous figure), goes through the irregularly shaped hole at 7 O'clock. Backing plate and drum - It is best at this stage to use the backing plate with nothing else attached to it to give the correct spacing between the shoes and roller cage so the backing plate will simply drop onto the whole assembly. This is what the assembly should look like. The backing plate should be able to be lifted out, and dropped back in, without disturbing the other components. Backing plate and lever - without disturbing the roller cage, rollers, or shoes, remove the backing plate. Find a suitable alignment for the lever. The copper alloy surfaces of the lever bear directly against the rollers, so, without disturbing anything, find a position into which the lever will drop, and lines up well with the backing plate. This will take several attempts, and each time you have to go back a few stages to realign the components you have disturbed along the way. Eventually you will find a suitable alignment for the backing plate and lever, and you can put them together as in the figure. Backing plate, lever and drum - carefully lower the reassembled backing plate and lever onto the drum getting the lug on the roller cage through its hole. This is tricky, but it should just all go together. How I do it is to align the lugs from the backing plate with their recesses in the shoes and the lug from the roller cage, then move the lever very gently until the whole assembly drops into place. Again it takes fiddling with, and several goes, but it will do it eventually. When you have the assembly looking like the figure you are essentially finished, with only a few details to sort out. Roller cage retaining spring - the little spring which attaches the roller drum to the backing plate should go on like this. Again, this is one of those things which is not immediately obvious, and indeed the spring sits uncomfortably in its position, but it is (as far as I can make out) correct. Lever return spring - the larger spring goes on like this. As with the roller cage retaining spring this spring doesn't seat particularly well, so it isn't obvious how it all goes together. It is best to start by treading the end of the spring which bears against the lever into the lever assembly, then putting the other end into its seat. Replacement of cover - The process of bending its lugs back, and prising the cover off, will have distorted the cover a little, so it will never again fit exactly. However it should fit reasonably well. If the cover won't fit anywhere near its position then the lever return spring is probably the culprit, so reposition that. You have basically finished at this point. 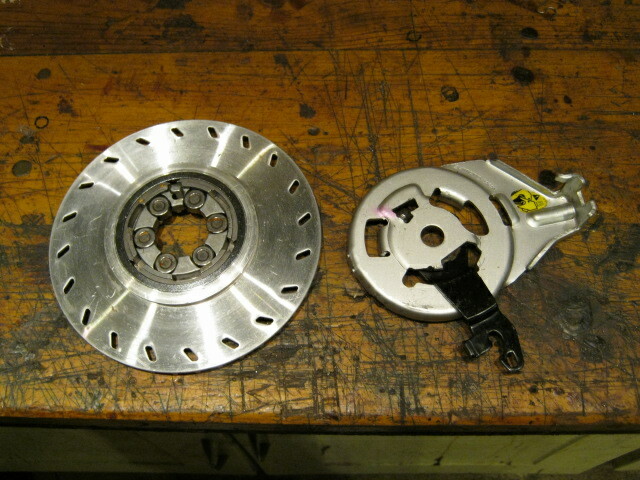 Until the brake is engaged with its wheel, and it is all bolted together, treat this assembly as likely to fly apart at any moment. 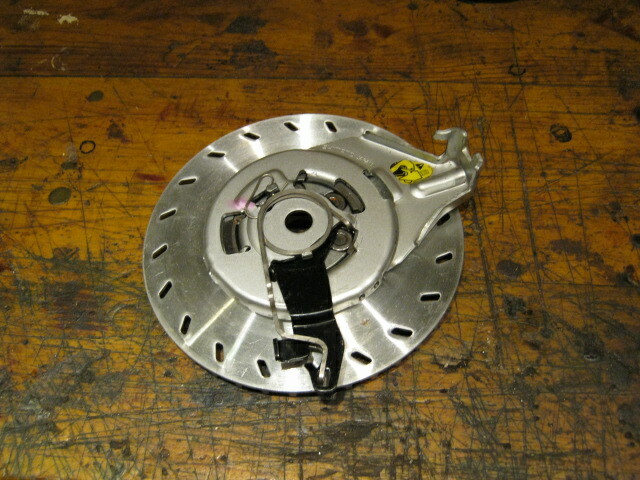 If you're going to store the brake then tape it together. This is not the easiest reassembly job in the world, and you can be at it for some hours before you get it to work. 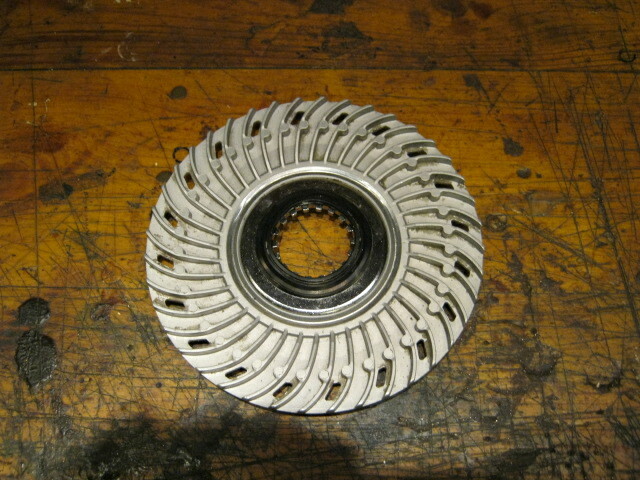 Successful reassembly is very order dependent, but once you have got the hang of it you'll wonder why you had problems. Jon, who is a bicycle mechanic says: Thanks for putting up your interesting page on the roller brakes, which encouraged me to open up the same brakes (on my Carrera Subway 8 too). I'm a bike mechanic and a bit of a bike collector, with a special fondness for hub gears, and couldn't resist the Carrera as it was quite cheap and has the premium version of the Nexus 8. I've always found this bike excruciatingly slow to ride compared to my other bikes, and decided to strip down and check the roller brakes, after checking the other typical culprits (wonky wheels, tyres with high rolling resistance, overtightened chain and wheel bearings, overtightened Nexus hub bearings, etc). 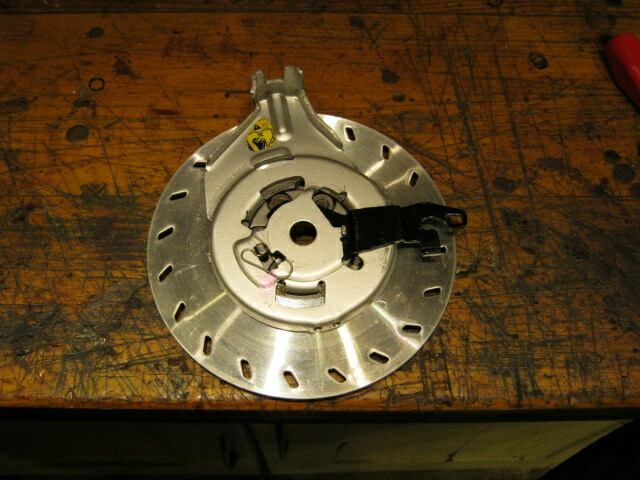 Taking the brakes apart and re-assembling them was actually really easy, and didn't involve bending any tabs. There's a tab under the black cover, and this tab can be prised out with a small, flat-blade screwdriver. During re-assembly, the tab is simply pushed back into the two matching holes, and then the black cover hooked back into position and pressed down into place again. The cover keeps the tab in position. I regreased the brakes carefully (using as little of Shimano's grease as would permit the brakes to operate correctly and reliably), and they still drag quite badly, in my opinion, compared to just about any other type of brake. In this particular respect, I think these roller brakes are a bit of a sub-standard piece of design, particularly the 'floating rotor', at least when lubed with Shimano's grease (the brakes are otherwise set up correctly). I considered using oil instead of grease, but there's not much space for the oil to pool inside the 'disc' when the bike's not in use, and when the brakes are applied, I can see oil being pushed out and over the edge of the v-shaped cavity into which the shoes move during braking. Maybe I should give it a go though, and just see what happens :-) Don't get me wrong - these brakes would stop a train, and the modulation is really quite impressive; but they weigh a ton (over 600gms for each removable assembly! ), and they drag. While the amount of drag might be reducible through choice and quantity of lube, I can't see it ever being eliminated. 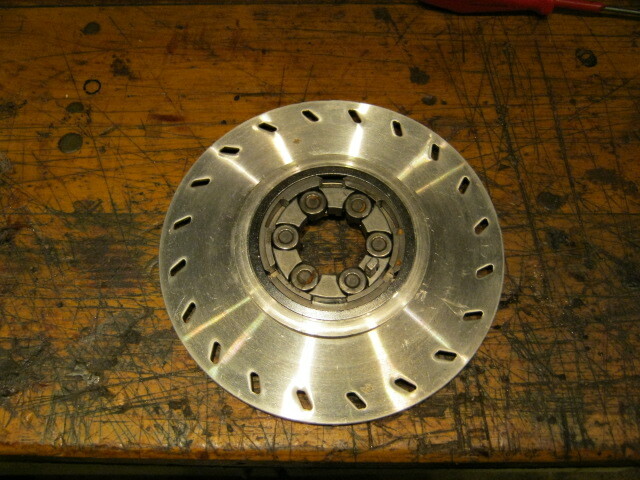 I'm probably going to get some hub adapters (there's a German company, I think, which sells them) to convert the roller-brake mounts on the hubs to take a six-bolt standard disc rotor, and then fit one of the better-quality cable disc-brake sets. The only problem with the adapters is that they cost 49 Euros each, and the cost of a pair is probably not far off what the bike is worth :-) Unfortunately, the rims have no braking surfaces, so I can't just fit rim brakes, and the bike's not worth rebuilding the wheels with new rims. Cheers, Jon.